Your work requires remembering lots of little tasks, details that you need to write down somewhere so they don't slip through the cracks. Put those tasks in Session Hub, attach them to a session, and you'll never have to worry about finding that Post-It or legal pad again. 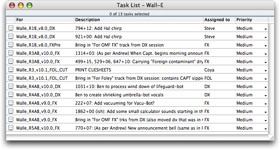 The tasks stay with the session wherever it goes. 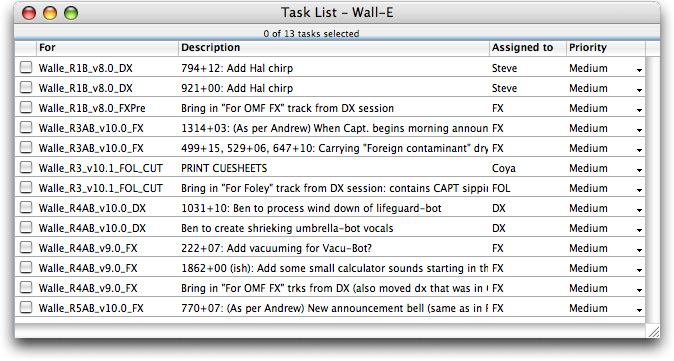 And you can see what's left to do on all sessions in the project so you can plan your time and resources accordingly. "You've been trying to cut reel 3, but the phone keeps ringing and the emails keep coming. People are giving you notes of things to do in reel 4 and reel 5. You write them down on post-its and stick them to your monitor. You run out of post-its so you write them down on a legal pad, but soon the legal pad becomes a mish mash of notes for different reels. When it comes time to cut reel 4, you try to gather up the post-its and scribbles that are just for reel 4. Pray you didn't miss anything!" With Session Hub, your To-Do list becomes part of your session, so you can easily plan ahead, avoid delays and collaborate productively.